Anyone that has ever tried to buy party supplies for a Minecraft birthday party will know that the ubiquitous theme is creepers, with everything having a green and black colour scheme. This just doesn't fit with my daughter's experience of Minecraft, so I had to be a little creative. If you look at her worlds, they are all full of colour, fun and general craziness, without a creeper or zombie in sight, and that's what she wanted for her party. 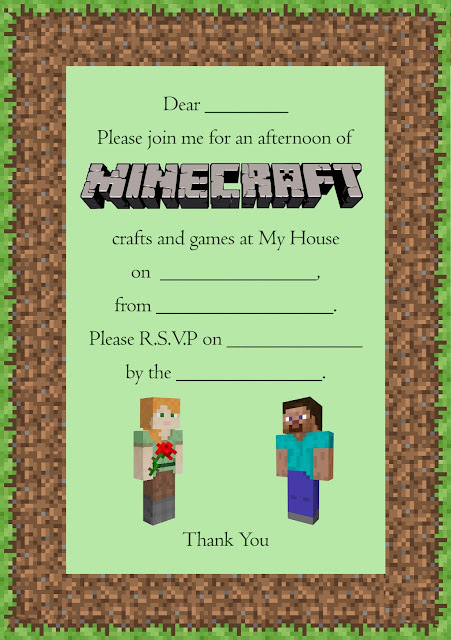 I couldn't find Minecraft party invitations that didn't have creepers on them either, so I designed them myself. This is an edited version of the invites I made. 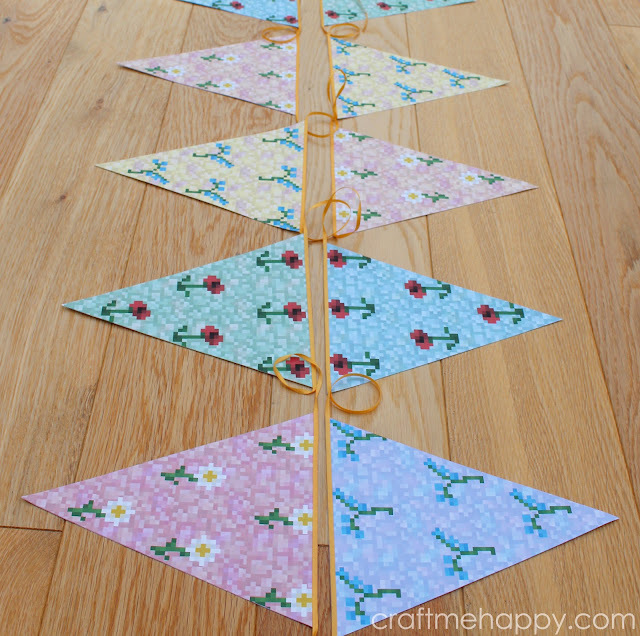 If you'd like to download one you should find it here. 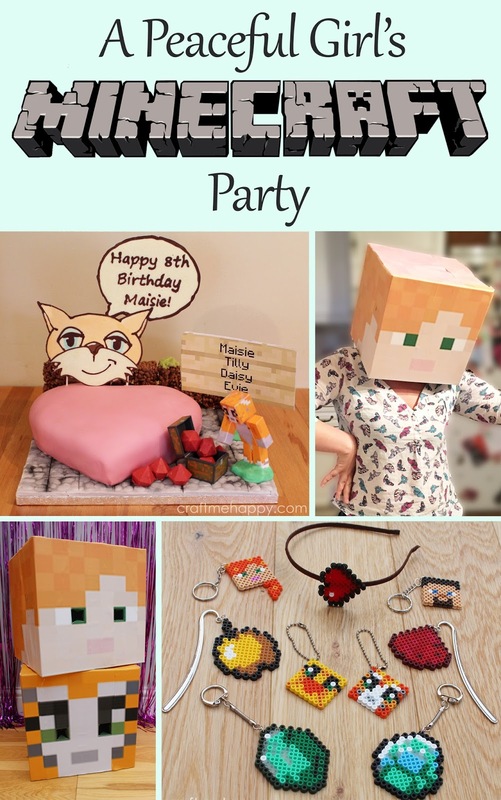 Bizarrely, the main reason she only wanted to invite three girls was because she's a big Stampy Cat fan (a Minecraft YouTuber) and she wanted a Love Garden themed birthday cake. 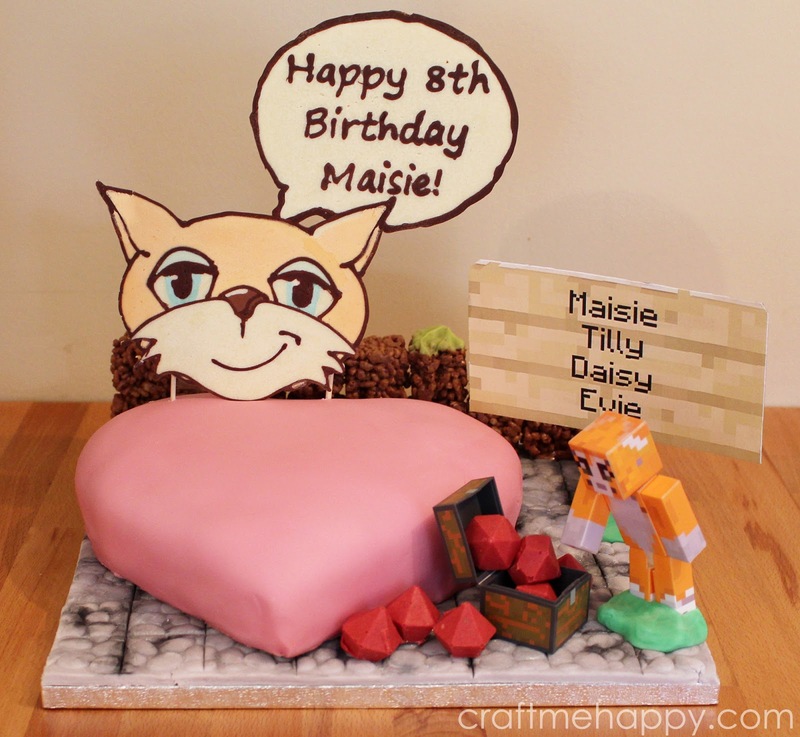 She was desperate to get into Stampy's Love Garden and so she designed her own cake with this in mind. As you can only fit four names on a sign, that was the number of children she wanted at her party. I wasn't complaining! 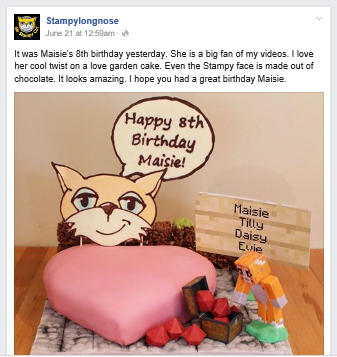 The Stampy Cat banner was made out of milk, dark and white chocolate, some of which had been coloured with candy melt colouring. To see the technique of how I made the cake sign, take a look at my Ghostbusters logo cake which uses the same method. It's really very simple and extremely effective. 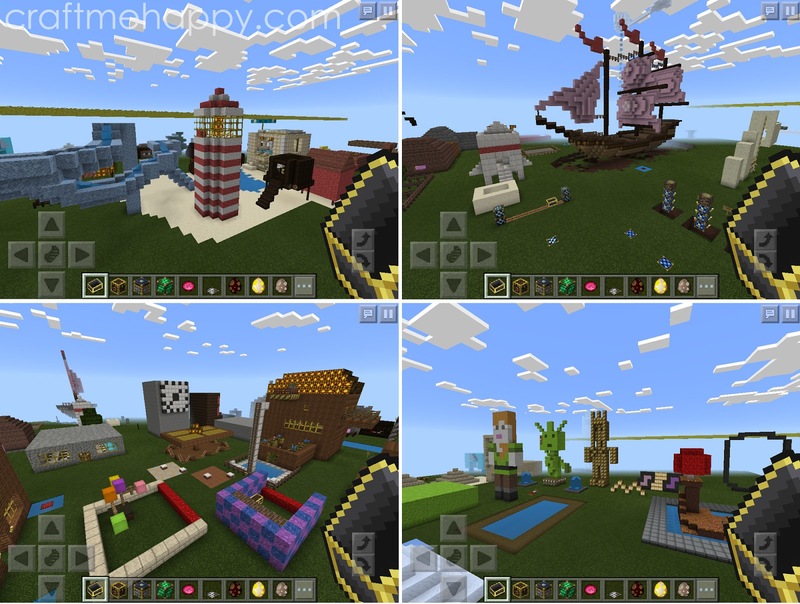 I already had some chintzy pastel bunting that I was intending to use to decorate the house, but my daughter complained that it wasn't pixelated - it wasn't Minecraft enough. She still wanted it to be pretty and so I made lots of pixelated triangles and dotted them with Minecraft pixelated flowers. They really brightened up the house and added to what was going to become a very colourful pixelated party. 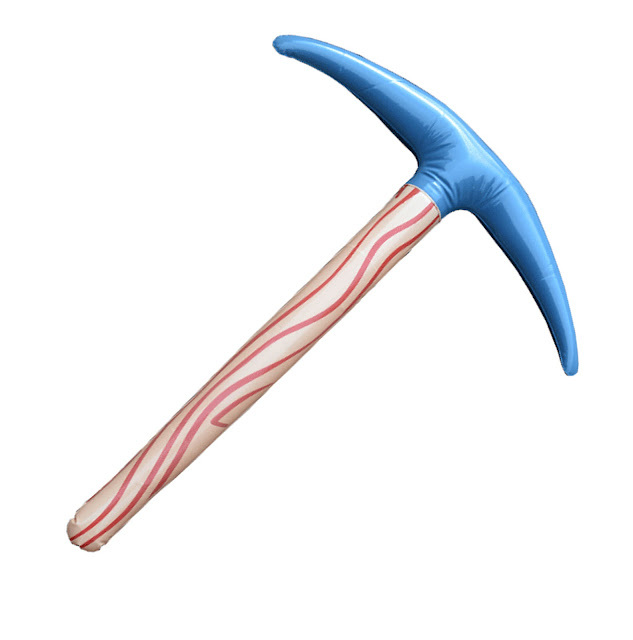 The girls had inflatable pickaxes to pose with, (and hit each other with), but I also made a couple of Minecraft heads. I would have loved to have made four, but I just didn't have the time. I had a fortnight to prepare everything for the party and as it approached I had to start seriously prioritising. In the end I made an Alex and a Stampy Cat head. They were great fun (even for the adults!) and the girls had a lovely time laughing at each other with the heads on. To make them I taped two 11 inch cake boxes together and then cut a circle out of the base for the head. In retrospect, 9 or 10 inch cake boxes would have been better for 8 year olds, but their over sized quality did add to the hilarity. 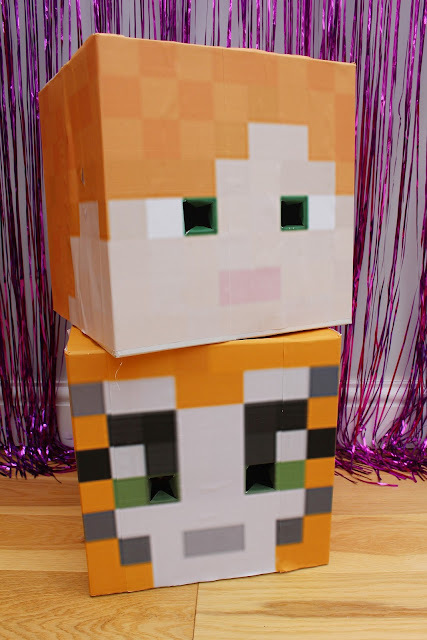 I found the skins for Alex and Stampy Cat online and I just enlarged them to the right size, blurred them slightly to flatten the colours, printed them out and then stuck them on with a glue stick. I actually planned two craft activities for the party - Hama beads and shrink plastic heads - but the first activity was so popular that I gave up on the shrink plastic heads and just put them in their party bags for them to do at home. Hama beads or Perler beads are a perfect Minecraft activity as everything you create is pixelated. 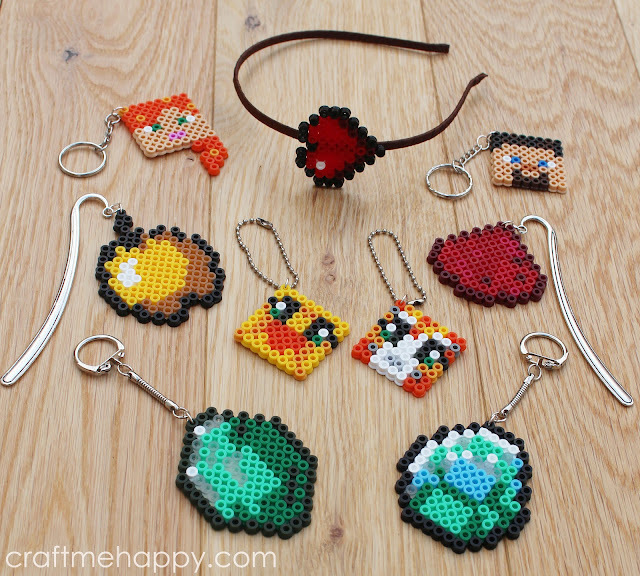 I wanted to make it more than just Hama beads though, I wanted them to be able to turn their creations into something useful. 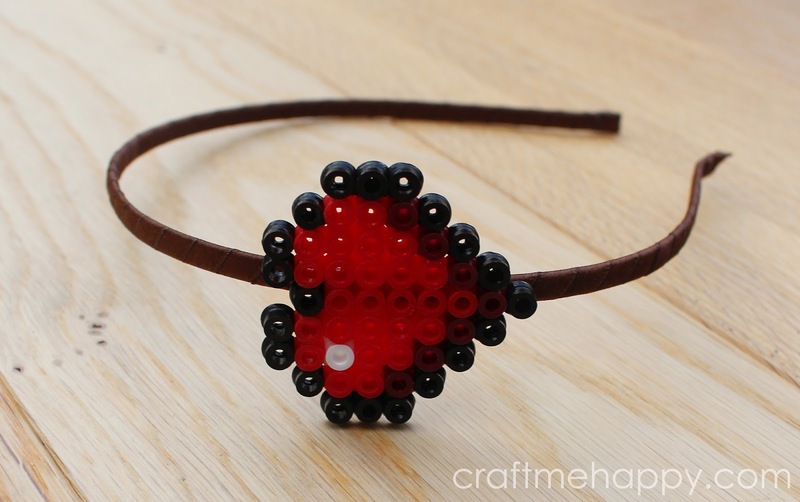 I made up lots of charts for the girls to follow and then thought of different accessories that the Hama pictures could be stuck on or attached to. In the end they made fridge magnets, headbands, bookmarks, key rings and bag tags. A couple of the girls went on to design their own creations and the charts I designed really helped to spark their imagination for other ideas. I was genuinely surprised by how much the girls loved this activity. They loved it so much in fact that they wanted to carry on after tea and so we ended up having a picnic on the floor so that we didn't have to clear away all of the Hama beads. I originally budgeted for this activity to end within the first hour of the party, but even after two and a half hours they were still coming back to their Hama bead pictures between party games. The party was three and a half hours long - the longest party I've managed so far - and so my aim was to simply plan as many fun activities as I could think of to fill the time. I'd much rather that we ran out of time than the girls got bored. 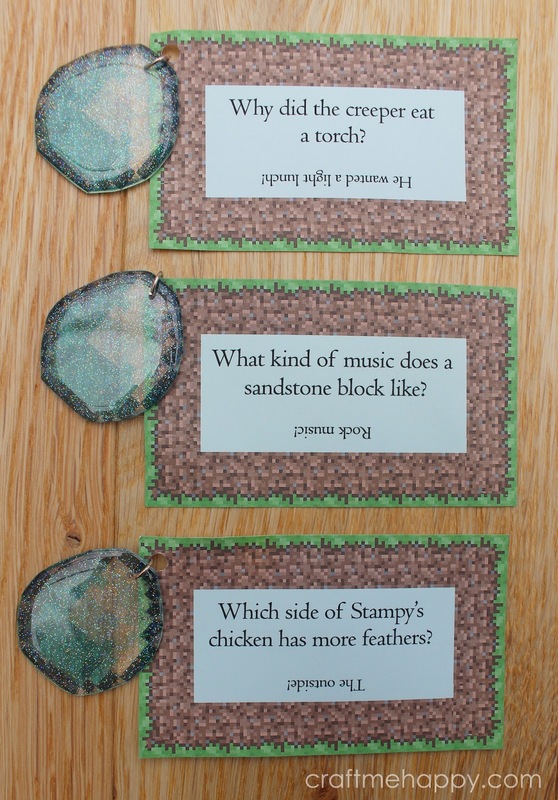 The first game was a diamond treasure hunt. I made 20 resin Minecraft diamonds and attached Minecraft jokes to each of them. 4 of them also had a gift attached. I bought the Stampy edition joke book and selected the 20 best jokes I could find in there. The book later became one of my daughter's birthday presents. While the girls were still playing with Hama beads I went into the garden and hid the diamonds and joke cards. They spent a lovely 15 minutes hunting for treasure and then telling each other the jokes - All of this went on while we were setting up the picnic tea. 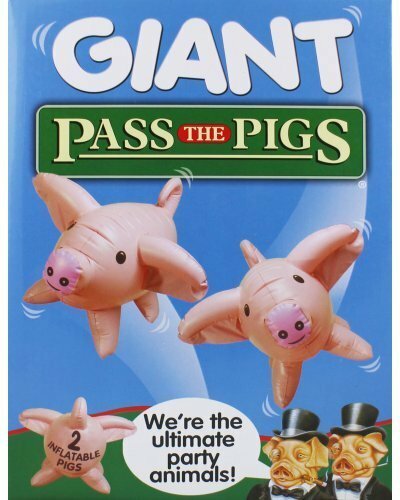 The girls also spent time in the garden playing Giant Pass the Pigs. Well you get pigs in Minecraft and we already had the game so I thought why not?! It worked really well with four girls as they split up into two teams, and as two pigs are thrown at the same time, nobody was waiting around to play. 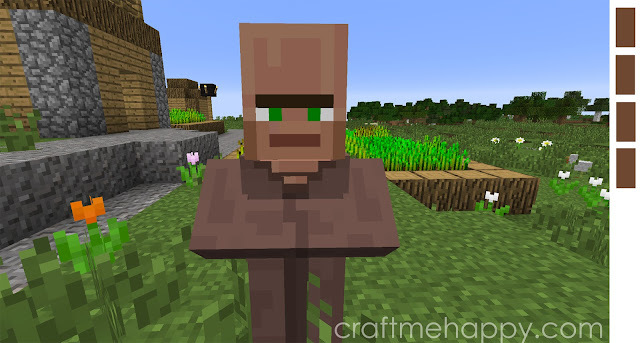 The last game we played was Pin the Nose on the Villager. I'd simply taken a picture of villager and removed his nose in Photoshop. I was slightly concerned that 8 year olds might feel that they are a bit too old for these kind of party games, but they absolutely loved it. I enlarged my image to fit onto three A4 sheets, laminated them and then laminated the noses so that they could be stuck on easily with white tack. 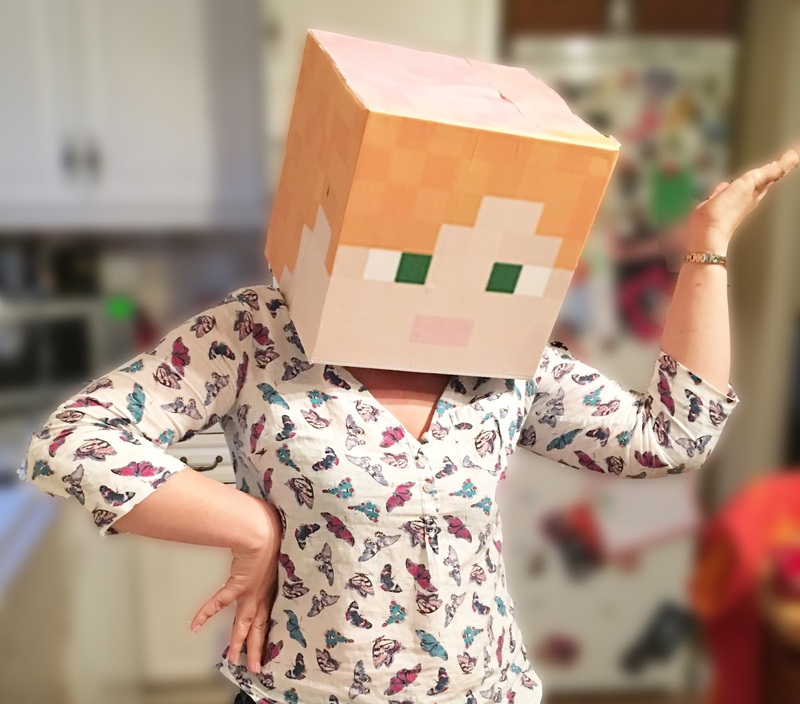 For blindfolds they took it in turns to wear the Minecraft heads back to front. You can find PDFs of my Pin the Nose on the Villager game here, here and here. 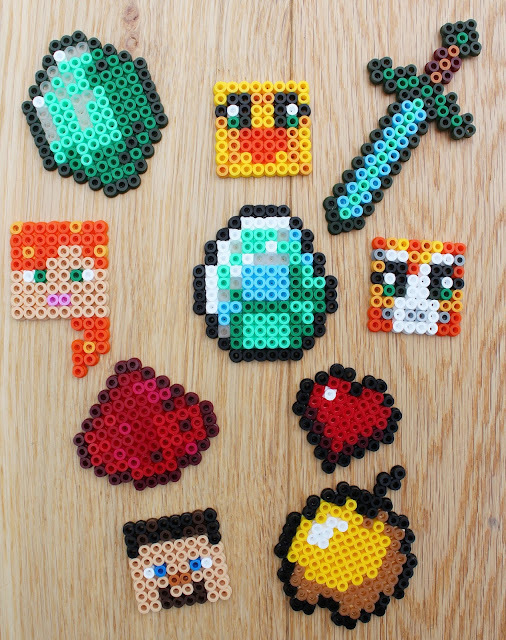 I did actually spend a whole day making another game that sadly, because the girls wanted to spend extra time making Hama bead pictures, we didn't get time to play - The Jumping Dispenser Game! It's based on the American party game called Junk in the Trunk, but me being British, and this being a party for 8 year old girls, I much preferred my name for the game. Maybe we'll get to play it next year - it's great fun! I didn't want to dedicate too much time to actually playing Minecraft at the party as one of the girls had never played Minecraft at all and I didn't want her to feel alienated. 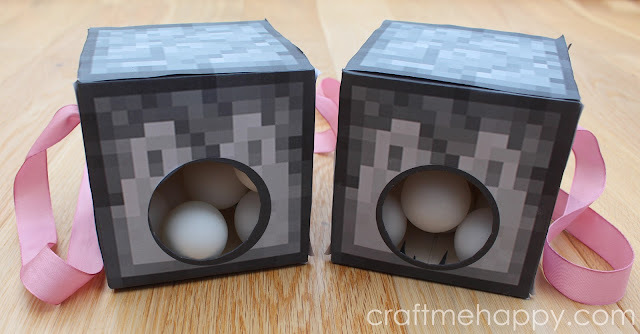 My daughter and I decided that as the time was limited and there were 4 children, it would be much better to play some kind of minigame within Minecraft. We decided that the community game Spleef would work well at a party. It's fast paced and the girls could take it in turns playing in twos and cheering on the other players without too much waiting around. The easiest solution we found for all the girls to feel involved was to have two girls playing on IPads, with the game mirrored onto the television using Apple TV. We did initially try it on XBox, but the 4 way split screen was just too confusing and the controls on the Ipad are much simpler and intuitive. After a frantic 10 minutes of trying to get the game started on the XBox, we quickly concluded that Minecraft PE was far better suited to the girl that had never played before. 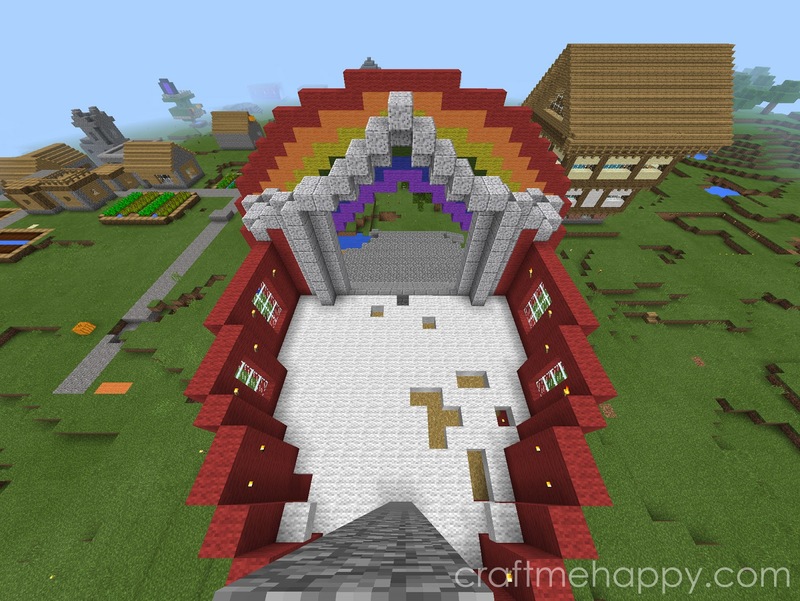 We already had a very simple Spleef stadium that my daughter and I had made between us, so we just put that build into action. 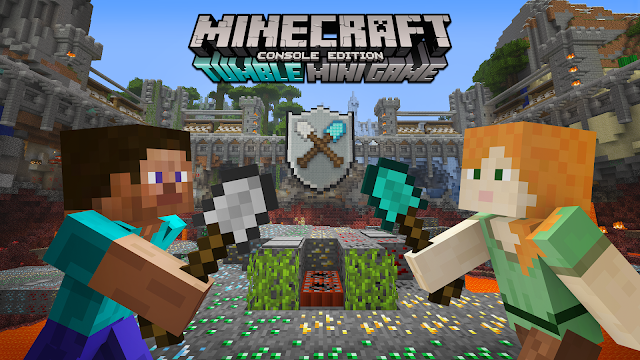 I should point out that this party was a few months ago; before XBox released the Tumble minigame. If everyone at the party had been familiar with the XBox controls, this would have been an ideal solution to everyone playing together. 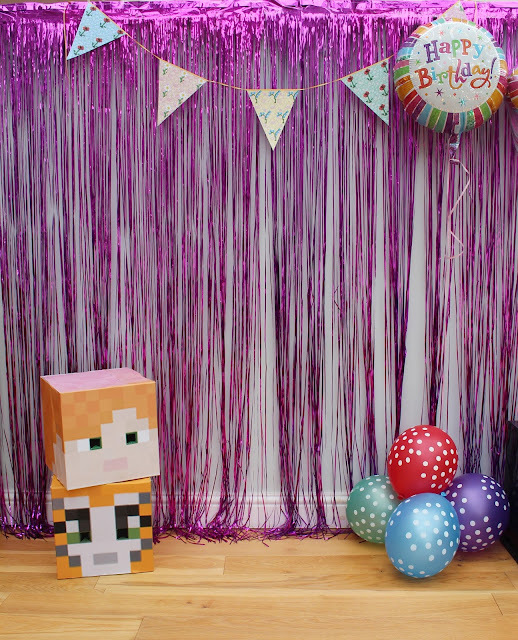 Aside from the crafts and the games we had lots of Minecraft parody videos playing on the TV throughout the party. That way, if the girls fancied a break from making Hama bead pictures they could have a dance and sing in the living room. My daughter's also a big fan of Sqaishey's Minecraft songs - many of which have the words at the bottom of the screen, so we had a mini interlude towards the end of the party of Sqaishey karaoke. Other than having a few cupcakes with grassy icing and of course a Minecraft themed birthday cake, the party food was pretty standard fare. Sausage rolls, crudites and dips, sandwiches, pizzas, crisps, biscuits and cake. I'd seen lots of Minecraft parties where the food was heavily themed around Minecraft. However as this was such a small party I felt that it would really be overkill for me to spend too much time theming the food. ...As a lovely conclusion to the party, two months after, my daughter did actually manage to get into Stampy's Love Garden and it absolutely made her day! I really hope this post has been useful to anyone planning a more peaceful Minecraft party. The party was such good fun to plan and host and all of the girls had a wonderful time - one girl said that it was the best party that she had ever been to, which made it all worth while. If you'd like to know more about any of the activites that I prepared for the party, do let me know. If there's enough interest, I'll put up another blog post with much more detail about that activity. This blog post contains Amazon.com affiliate links to products that I purchased for the party. If you click through and purchase, I will receive a very small percentage of the purchase price.